1. Start with 105 Epoxy Resin, the basic ingredient of all WEST SYSTEM Epoxy compounds. You’ll find it at the upper left of the Epoxy Selection Guide. 2. Select the epoxy hardener with the cure speed and recommended cure temperature to best suit your working environment. If clear coating, choose blush-free 207 Special Clear Hardener. 3. Choose a metering dispensing system. For most epoxy applications, 300 Mini Pumps are convenient, accurate and economical and contain everything you need whether you are using a 5:1 Hardener (205 Fast or 206 Slow Hardener) or a 3:1 Hardener (207 Special Clear or 209 Extra Slow). For larger projects or long-term shop usage, you may want one of our higher capacity metering pump models. These pumps are dedicated to metering epoxy at a 3:1 or 5:1 ratio, so choose them based on which hardener you normally use. 4. For bonding or fairing operations, select a filler based on its intended purpose, handling characteristics. or cured physical properties. Fillers are categorized as adhesive (for epoxy bonding and coating operations) or fairing (for sanding and smoothing operations). 5. If needed, add one of four WEST SYSTEM additives to the epoxy to provide specific coating properties such as enhanced abrasion resistance. Pigments are also available to color the epoxy without compromising cure. While our application tools are not featured on our Epoxy Selection Guide (in the interest of simplicity), these make handling and applying epoxy neat and convenient. Also not featured are reinforcing materials. Use these to add strength and abrasion resistance wherever your project needs it the most. The Epoxy Selection Guide was designed for those who are getting familiar with the 105 System, so does not feature our Specialty Epoxies or Boat Repair Kits. Be sure to check those out in case they’re a better fit for your specific project. WEST SYSTEM 105 Epoxy is a professional quality, two-part epoxy system developed for high strength and good versatility. The Epoxy Selection Guide is a handy tool to help you pair 105 Resin with a choice of four hardeners to best match your working temperatures, desired cure speed, and coating clarity. If you’re looking for a blush-free, water-clear finish, 207 Special Clear Hardener is your best choice. All 105 Resin-based epoxies are structural-grade marine adhesives, including 207. All are easily modified with our proprietary fillers and additives, which let you tailor the product to your specific bonding or coating application. Structural, marine-grade 105 Epoxy Resin and Hardeners are trusted by boat builders and repair professionals worldwide. They’re also popular for all kinds of marine repairs, restoration, home repairs, and projects that demand lasting strength and superior resistance to moisture vapor. 105 Epoxy bonds to fiberglass, wood, metal, reinforcing fabrics such as fiberglass, and many other composite materials. Originally developed for boat construction, it is the professional’s choice for all kinds of marine applications because it is proven to withstand the rigors of harsh marine environments. 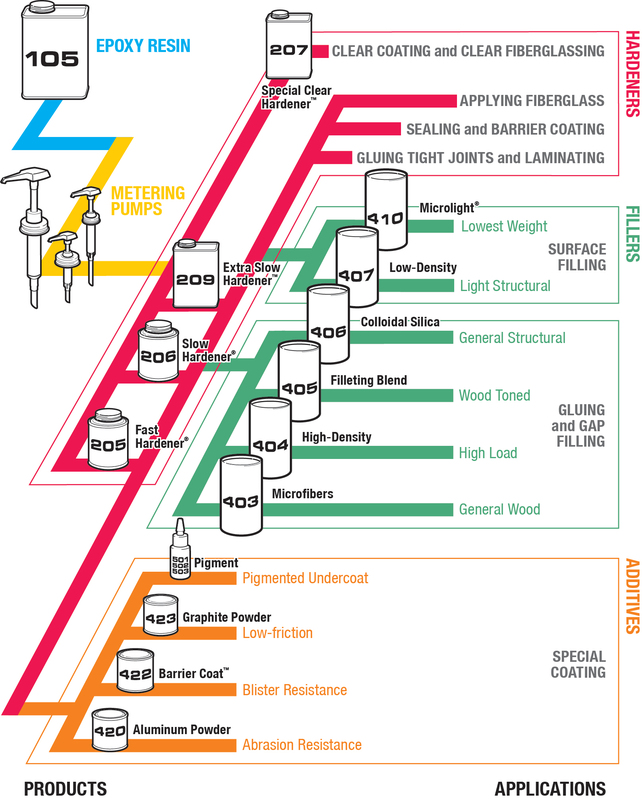 We hope our Epoxy Selection Guide is a help to you in getting started.